There have been some big stories in the news over the past week: Nasa landed a probe on Mars, a previous president passed away, and the XFL finalized which cities will receive franchises for (another) inaugural season. But none of these stories can hold a (Hanukkah) candle to the really big news: Hallmark plans to add 2 Hanukkah love stories to the annual December onslaught of cheesy holiday films next year! Oy Vey, this is big time! There are very few holiday love movies geared for the MOT (Member Of the Tribe) audiences. Unfortunately, Adam Sandler crap has been about it. Honestly, has he done anything funny since Waterboy? But Hallmark knows what they are doing with cheesy holiday love stories, so much so that they launched 34 new Christmas movies in 2018 alone! Most the Hallmark Christmas movies utilize the same tried and true formula (basically having Danica McKellar and a rich prince fall in love, have their love experience doubt due to some type of misunderstanding with about 20 minutes left in the film and then have everything resolved in time to share a kiss beneath the Christmas tree). While most of that same successful format can be used for the Hanukkah films, a few slight changes will need to be made. For example, we won’t need the staple ‘making a mess while decorating the Christmas tree’ scene. That scene would be substituted for a ‘making a mess while cooking Latkes potato pancakes’ scene. A 30 something advertising executive (who looks remarkably similar to McKellar) in New York City (because it is an unwritten law that the protagonist of these films work in some form of media in NYC) loses a Dreidel competition to her Bubbe (the Yiddish word for grandma for those thinking what does Michael Buble have to do with this). From the makers of Mensch On A Bench! Available on Amazon.com! Two young, attractive, but recently separated parents plan to drop off their hyper toddlers at their “Bubbe & Zaydes” apartment for Hanukkah but a freak blizzard rolls into town and they are snowed in for (ironically) 8 nights. How could things possible devolve from there? Easy, they are unable to find replacement chargers for their children’s dying tablets! Yet through some form of divine intervention, the tablets were able to survive on 1% power for 8 straight nights. Any parent will tell you that is a true miracle! Don’t forget to order your charger from Amazon.com! Things get heated between two young people during the Temple’s annual Dreidel competition. Ari wins via some form of technicality and the competitive Shana just will not let it go. They both seek out the same Dreidel coach, an old Rabbi who looks surprisingly like Gandolf from Lord of the Rings, for new spinning techniques. He convinces them to team up together for the big World Series of Dreidel Doubles competition against a rival temple taught by the Rabbi’s old disciple from the other side of the Brooklyn Bridge. Through the long joint practices filled with unique and questionable training techniques (which it turns out the old Rabbi had been expelled from the National Dreidel Association for), the two fall in love while mastering these new maneuvers. They go on to win the title for their temple, redeem their Rabbi and share an enchanted moment while simultaneously lighting the Shamus candle. A menorah candle factory is in danger of being foreclosed because the younger generation has lost all ‘Hanukkah Spirit’ and only want electric menorahs, but our protagonist (a young attractive woman) will stop at nothing to save her parent’s candle factory! The bank representative (a young attractive man) initially can’t wait to foreclose the factory so his bank can sell the land to a developer. 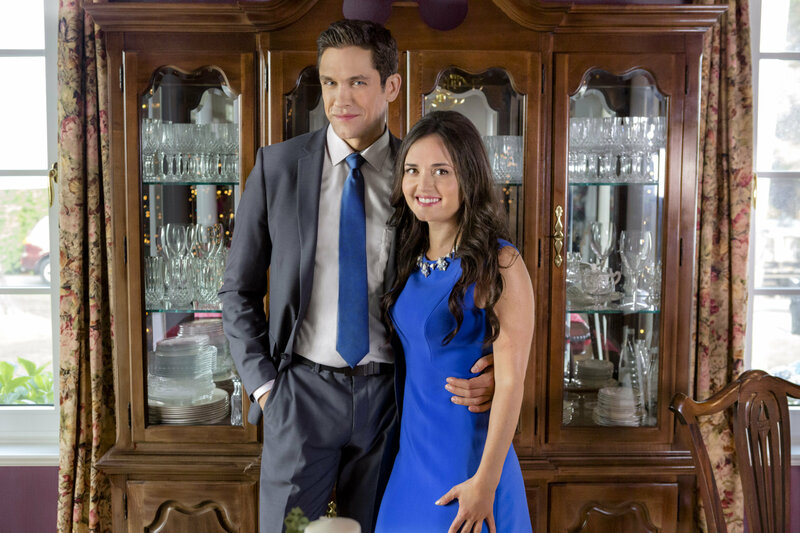 However, after spending time with our determined Danica McKellar-looking heroine, he soon discovers the Hanukkah spirit as he learns what the festival of lights is all about. He helps return the family business to profitability while falling in love. They share an enchanted moment while simultaneously lighting the Shamus candle. A stuck-up young attractive blogger is living out her own “Groundhog’s day” adventure. Only for her, it is Christmas day and she is supposed to be meeting a blind date for lunch at a New York kosher Chinese restaurant. She has been an evil person towards multiple people in the community for years and, unbeknownst to her, had an old Yiddish curse put on her. She is stuck reliving this day until she performs enough good deeds to break the curse. She meets a nice young man who volunteers delivering Chinese food to the Jewish old folks home for Christmas lunch. Over the course of many days of assisting him, she learns from him how to be a good person and finds she enjoys it. For those that were unaware of this tradition. The curse is lifted as the two of them share an enchanted moment while simultaneously lighting the Shamus candle. Think Christmas Vacation (my favorite Christmas movie) but over the eight crazy nights of Hanukkah instead as Herchel W. Horowitz invited both sides of the family over for the festival of lights. Hilarity ensues as the cast of various eccentric characters brings Herchel’s dream of a big family holiday crashing down all around him. The families clash over who gets to light the menorah candles. The Bubbes bicker over who makes the more flavorful brisket. Zayde Cohen needed to be bailed out of jail after he started an emotionally charged dreidel competition at the Gambler’s Anonymous meeting. Crazy cousin Ezekiel nearly burns the house down from using way too much oil being used to fry the latkes. And Herchel is on edge waiting to see if Bed Bath & Beyond will place an order for his most recent invention: The Vertical Brisket Cooker. Both families eventually discover the real meaning of Hanukkah is simply being together as a family. Both families share an enchanted moment while simultaneously lighting the Shamus candle. A young attractive business executive travels to the tiny little known Jewish country of Kosherstan, the world’s largest supplier of Hanukkah menorah oil, to negotiate lower rates for her company with the nation’s young handsome prince. Kosherstan nationalized all menorah oil production so the profits can be shared with its citizens so the royal family negotiate all import/export terms. The young handsome prince, as it just happens to turn out, must marry a Kosherstan citizen by the end of Hanukkah that year or must vacate the thrown due to some obscure rule no one knew about until the sleazy uncle discovered it. They could cast a mannequin and a toaster oven and there would be more on screen chemistry than these two had. She tells her father, back home in Brooklyn New York, of her trip and he becomes cryptically uneasy for her and warns her to be careful. Over the course of the negotiations she falls in love with the prince and the scenic European village sets and stock countryside footage that we have previously seen in nearly every other holiday movie movie on Hallmark. She also learns that her parents emigrated from Kosherstan to the new world shortly after she was born meaning she actually has duel citizenship of both the U.S. of A. and Kosherstan! Who saw that revelation coming! The prince and our heroine fall in love and they share an enchanted moment while simultaneously lighting the Shamus candle. Two mobile phone app designers (young male and young female) are forced to complete a new dating app in only eight days by their demanding and uncompromising boss. He can’t stand her obsessive compulsive behavior and she can’t take one more minute of his sloppy laziness. Yet, through hard work, they discover that opposites attract. They meet the client Christmas day for the final pitch at the only open restaurant they could find (a kosher Chinese Restaurant) and land the contract! They fall in love over an enchanted moment while simultaneously lighting the Shamus candle. Well, what do you all think? Do any of these pitches have the potential to be optioned by Hallmark Channel? Or perhaps by Netflix, FreeForm or one of the other lower quality venues? Which was your favorite? what are your ideas? Please comment, hit the ‘Like’ button and share with your ‘MOT’ friends. Ugly Hanukkah Sweaters exist as well…unfortunately.